Loukya Boddapati is a Research Fellow at INL funded by Marie Curie COFUND. She works at Department of Advanced Electron Microscopy Imaging and Spectroscopy, within the Nanostructured Materials research group. Her research project at INL is focussed on exploring the advanced electron microscopy imaging and spectroscopy tools for nanoscale investigations of atomically thin layered transition metal chalcogenides which have several potential applications. 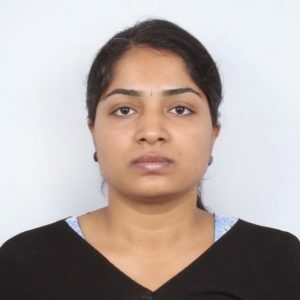 Loukya Boddapati obtained her PhD on Magnetic Thin Films from International Centre for Materials Science (ICMS), Jawaharlal Nehru Centre for Advanced Scientific Research (JNCASR, India), under the supervision of Dr. Ranjan Datta. Her work was based on electron magnetic circular dichroism of epitaxial magnetic thin films at the nanoscale. During her PhD (funded by Department of Science and Technology, India) she worked extensively on aberration corrected transmission electron microscopy techniques for studying magnetic, structural, compositional and spectroscopic properties of thin films and nanostructures at the nanoscale. She worked as Research Associate at JNCASR for one year before joining INL as Marie Curie COFUND Research Fellow in the year 2018.